One Thanksgiving down, one to go. In normal people world, planning to cook my first major dish for family Thanksgiving might have caused some anxiety for someone who doesn’t know how to cook, since holidays are already fraught with tension and too many hens in the kitchen just adds to the angst. 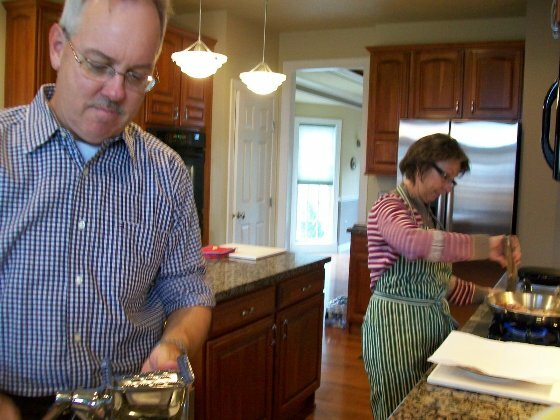 But I was pretty excited because A) um, my parents aren’t exactly food critics, and B) this was the first time my parents and I would be in the kitchen together—cooking together—since I started this project. I could finally make good on my threat to teach my mom how to cook. I had decided early on, in like August, when my mom first asked me to start thinking about what I wanted to eat for Thanksgiving (yes, August, for real, and she asks me what I want for Christmas in June, so…I would say she contributes significantly to my obsessive love for the holidays) not to mess with our tried and true Thanksgiving formula, because even though we discuss the menu and possible alternatives ad nauseum as if it will make a difference, it doesn’t; we still have the same thing every year, and every year we have sweet potato soufflé. And since it was sweet potato week on the blog, this year sweet potato soufflé was all mine. But I’m still me and I wanted to get as fancy as I could with the soufflé recipe without upsetting the apple cart too much. I could have used my mom’s recipe, but because this project is all about learning to cook new things in new and different ways, I owed it to my sweet potatoes to root out a great idea so we’d have something new and different on the table, but I also didn’t want to stray too far from our same-y same regularness, so my dad would eat it. Thanksgiving morning my dad was going over the schedule of what would be cooked when so that everything came together at once (he may not be a master chef, but he possesses the kitchen skill I envy most, so he’s OK in my book), and I saw my chance to get into and out of the kitchen before all the day’s madness happened. Despite this great opportunity to cook with my parents for the first time since my dad taught me how to make a grilled cheese when I was 12 (the one food item I cook well, and the one thing I could eat every day for the rest of my life and be perfectly happy, so technically, my dad did teach me everything I ever really need to know about cooking), I still prefer to be in the kitchen alone, so while everyone was waking up and getting dressed and before the real cooking started, I snuck into the kitchen and tried my damndest to make some sweet potatoes by myself. I had barely started mashing the potatoes (which I was doing with a mixer because my dad didn’t know what a potato masher looked like and swore they didn’t own one, a fact I believed since we always ate potatoes out of a box growing up, but later when I located a masher and showed it to him he said, ‘Well, huh, lookie there’…thanks, Dad) when my paparazzo mom came bounding around the corner with the digital camera I gave her last year for Christmas, swearing she has finally learned how to use it and if I would please just hold still…. So I paused to give her a few lessons in digital photography, which was totally by design, because then she became engrossed in exercising her newfound expertise (and was therefore less interested in asking why I was doing what I was doing every single step of the way). Most of the photos herein are hers. I think they’re quite good; don’t you? Once I was done furtively combining all my ingredients and I had let my mom take a sufficient number of photos of the process, we examined the final product before putting it in the oven. It looked kind of…wet. Was it supposed to be this wet? It was really wet. At this point…I…asked my mom what she thought. Cringe. To be fair, I’d never made a sweet potato soufflé before and I really hadn’t ever eaten it either, so I had no idea how wet or congealed or mushy it was supposed to be, but I figured she’d been making it every Thanksgiving for 20 years, so she would obviously know way better than I would, despite my arrogance about being the best cook in the house, and sigh, what an, ugh, awesome opportunity for her to…help me. If I had known we were making a casserole and not a soufflé, I probably wouldn’t have panicked at this point and would have chalked up the wetness to the fact that this was just a totally different recipe, but I didn’t make all those connections, thus the panicking. Mom’s solution: cornstarch. She said it thickens without adding taste. I have to admit, that was kind of a cook-like thing to know. It came out looking totally normal and it looked beautiful on the table with the rest of our regular, same-y same Thanksgiving feast, which was delicious and perfect and wonderful. And holy sweet sweet potato soufflé/casserole, it was like, dessert sweet. I liked it just fine, but more importantly, my dad loved it. Win. Bake them on an aluminum foil lined pan at 375 degrees for about an hour, then peel and mash. 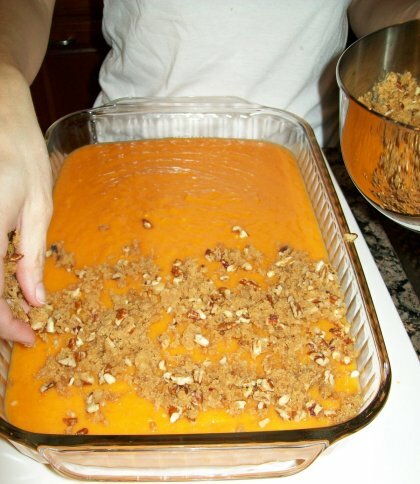 Combine ingredients above and put in greased baking dish (13×9 pyrex oblong works well). Combine topping ingredients and pour over potato mixture. Bake uncovered at 350 degrees for 30 minutes. Serve and enjoy! To their credit, they did start doing actual cooking after they bought those fancy fancy pots and pans instead of a trampoline (still smarts a bit). Also, I can totally see this whole scene unfolding (partly because Mom already told me about it), and I can especially hear Dad saying “well lookey there.” You did a masterful job of portraying a Benz family Thanksgiving. Glad to be part of the war and honored to provide the recipe! Look forward to trying your standard souffle one year. But first, on to another battle! Souffle usually comes in a souffle dish, and it is puffy…they’re incredible difficult to cook, apparently (not that I’d know…souffles are the I-285 of cooking…don’t drive on 285, don’t cook souffles). 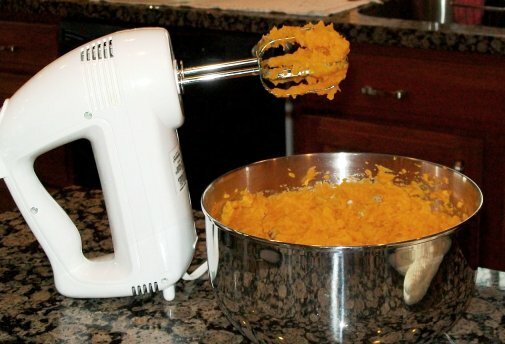 Sure, sure Alton Brown will tell you it is easy, but it isn’t. It will fall. It will be soupy. The texture will be wrong. You have to have the exact right temperature and DO NOT open the oven door, else it will deflate. Souffle and Yorkshire pudding…both hard. Apparently. Howsomeever, looks like you did a bang up job, pal, so congrats!